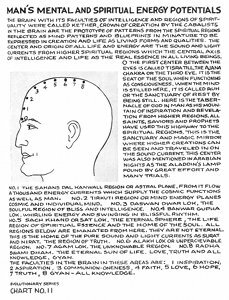 The brain with its faculties of intelligence and regions of spirituality were called Kether [Keter], crown of creation by the Cabalists. In the brain are the prototype of patterns from the spiritual regions reflected as mind patterns and blueprints in minature [miniature] to be expressed in creation and life as living forms and qualities. The center and origin of all life and energy are the sound and light currents from higher spiritual regions which the central axis of intelligence and life as the real essence in all living beings. [No.] 0 the first center between the eyes is called tisra till [tisra til], the Ajana [Ajna] chakra or the third eye. It is the seat of the soul when functioning as consciousness. When the mind is stilled here, it is called ruh or the sanctuary of rest by being still. Here is the tabernacle of god in man as his mountain of inspiration and revelation from higher regions. All saints, saviors and prophets have used this highway to the spiritual regions. This is the sanctuary and magic mirror where higher creations can be seen and traveled in on the sound current. This center was also mentioned in Arabian Nights as the Aladdin's lamp found by great effort and many trials. No. 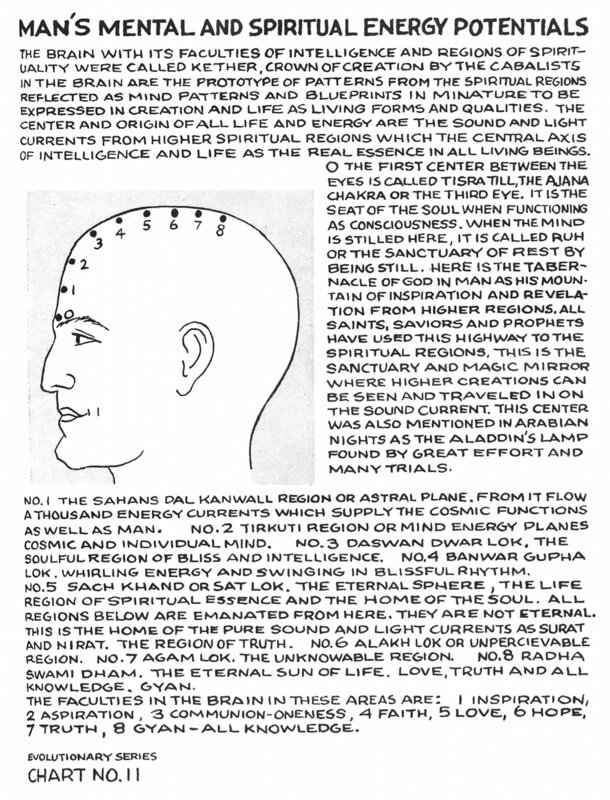 1 The Sahans dal Kanwall [Sahans dal Kanwal] region or astral plane. From it flow a thousand energy currents which supply the cosmic functions as well as man. No. 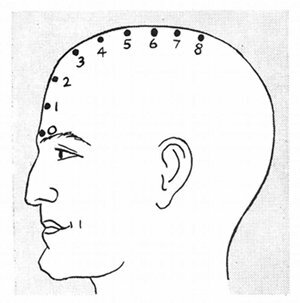 2 Tirkuti [Trikuti] region or mind energy planes cosmic and individual mind. No. 3 Daswan Dwar Lok. The soulful region of bliss and intelligence. No. 4 Banwar Gupha [Bhanwar Gupha] Lok. Whirling energy and swinging in blissful rhythm. No. 5 Sach Khand [Sac Khand] or Sat Lok. The eternal sphere, the life region of spiritual essence and the home of the soul. All regions below are emanated from here. They are not eternal. This is the home of the pure sound and light currents as Surat and Nirat. The region of truth. No. 6 Alakh Lok or unpercievable region. No. 7 Agam Lok. The unknowable region. No. 8 Radha Swami Dham [Radhaswami Dham]. The eternal sun of life. Love, truth and all knowledge. Gyan. The faculties in the brain in these areas are: 1 Inspiration, 2 Aspiration, 3 Communion-oneness, 4 Faith, 5 Love, 6 Hope, 7 Truth, 8 Gyan - All knowledge.